The Causeway Coastal Route, which stretches for 200km, has plenty to offer. Carrick-a-Rede rope bridge connects the mainland to a small island from which salmon fishermen used to cast their nets. Belfast, known as ‘the Old Smoke’, is a city of many faces. Its trendy bars, quaint city centre shopfronts and regenerated areas paint a picture of a quirky, young town. At the same time, it is set against a backdrop of Republican and Loyalist murals, and armoured police cars still trawling some streets, which serve as a glimpse into the troubled past of Northern Ireland’s capital. City Hall, an imposing Victorian building topped with distinctive green domes, is the starting point for most visitors. Several main streets branch out of this central zone and you will undoubtedly find yourself following the route to the River Lagan’s edge. While taking a walk along the waterfront, don’t forget to pay The Big Fish your respects. Rumour has it if you kiss this oversized ceramic salmon, you will gain knowledge. Given that the sculpture has only been in place since 1999, it’s probably a ploy to make some tourists look like fools... and it’s actually working! Across the river and away from the city centre lies one of Belfast’s newest and biggest attractions: the Titanic Belfast experience. This striking building was opened in 2012 to coincide with the centenary of Titanic’s maiden voyage. It features a highly interactive exhibition made up of nine galleries delving into early 20th-century Belfast, the building of the vessel and, of course, its tragic end. Highlights include a ride on a mini-car through a recreation of a shipyard, and a 360-degree computer-generated tour through all the levels of Titanic. Another recommended attraction which gives an insight into Belfast’s history is the Crumlin Road Gaol. In operation for over 150 years, the walls of this building have a few stories to tell. The guided tour will let you in on some of the secrets of its dark past. 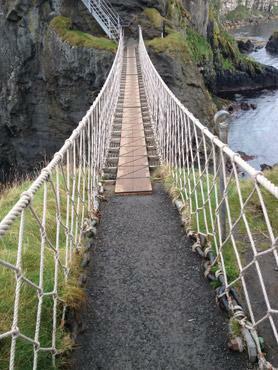 If you have enough time to spare, the Causeway coast is only an hour’s drive from Belfast. For most visitors to Northern Ireland, the Giant’s Causeway is top on their to-do list but the Causeway Coastal Route, which stretches for 200km, has plenty else to offer. Dunluce Castle is an atmospheric medieval ruin, perched on basalt outcropping and joined to the mainland by a small bridge. The ruins still offer the opportunity to make your way up winding staircases and take in a panoramic view of the Atlantic Ocean in all its glory. The entrance fee is inclusive of an audio guide which does a great job of building up a complete picture of the once bustling castle. Tales of Vikings and warring clansmen will set the tone for the rest of your journey along the coast. A few miles further along the route is the attraction that draws most people so far north in the first place: the Giant’s Causeway. This unique landscape is the result of a volcanic eruption or, if legend is to be believed, the doing of giant Finn MacCool. Regardless of which version of history you would rather subscribe to, the Giant’s Causeway is an interesting place to spend an hour or two and offers some breathtaking views. The unfortunate side to its being such a remarkable area is that thousands of tourists flock to it every day so you will have to compete with the crowds for your photos. If hiking interests you, there are some trails that can be followed which will take you a little further away from the hustle and bustle. The next stop on the coastal route is not for the faint of heart. Carrick-a-Rede rope bridge connects the mainland to a small island from which salmon fishermen used to cast their nets. Halfway across the bridge you may chance a look over the edge, down into the spirally depths of a 30-metre chasm. It’s a terrifying experience for anyone afraid of heights. However, successfully making it to the other side and back will earn you bragging rights for years to come. 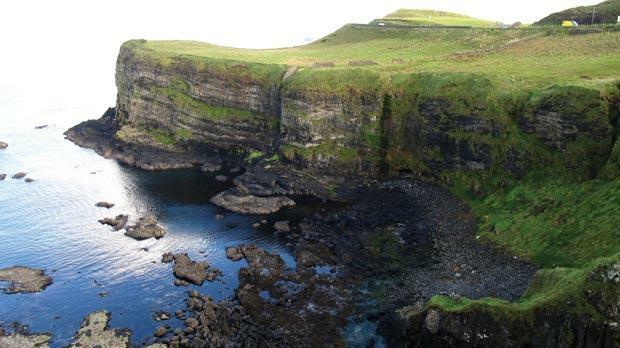 Whether you make it across the rope bridge or not, the kilometre walk there is all that is needed to convince anyone that the coastline of Northern Ireland has to be one of the most spectacular vistas in the world. This trip along the coast takes roughly five hours, including the obligatory tea and scones break, and is well worth taking some time away from Belfast for. The coast road continues to wind its way along by the sea and back down to Belfast, which is a great way to end the day. Back in Belfast, it would be a crime not to spend an evening partaking in the preferred of all Irish pastimes: a pint and banter in a pub. The Garrick Bar is one of the city’s oldest pubs and if you time your visit well, a traditional music session may be in full swing. Belfast’s busy city hub is small enough to delude visitors into thinking a long weekend is enough to see all that is on offer. While a few days will give you a feel for the place, there is certainly enough going on to keep you coming back for more.